I haven't shared a collection related post with you guys in such a long time and it's time I changed that. 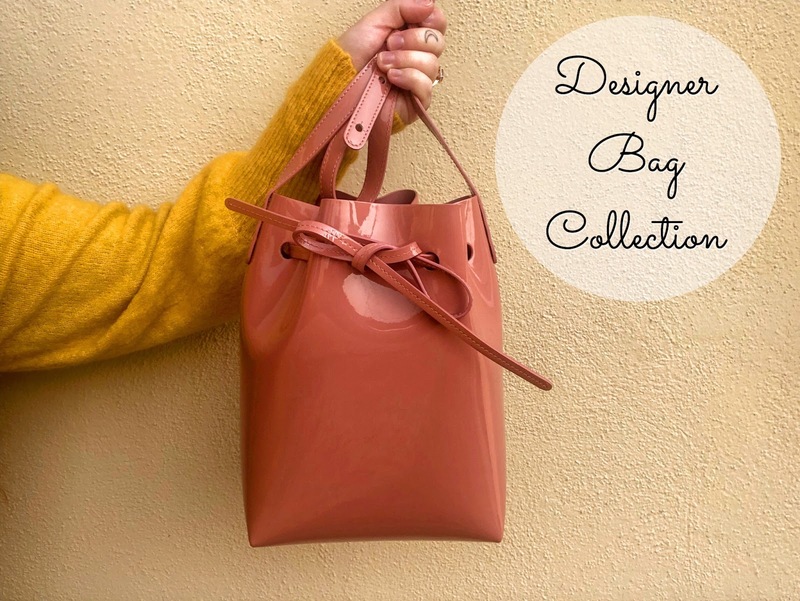 I feel this is the perfect time to share a brand new collection in which consists of my designer bag collection! I have to admit I have had this on my blog post idea for several months now and never got around to completing it until now. Watching handbag collections videos on Youtube are one of my favorite videos to watch, along with 'what's in my bag' videos. It's so much fun to lust over someone else's collection and a fun way to see more of other's style. My collection has changed so much over the years. My tastes and style have also evolved since then. At this point, I am very content with how my current collection looks like. So without taking up any more time, if you are interested in finding out more regarding my designer bag collection just keep on reading. I will be going in the order in which I was given/or purchased my handbags. The first bag in my collection is one of my favorite black bags that I own, the Marc by Marc Jacobs large Classic Q Natasha crossbody bag. I remember wanting to own this bag so long and in Christmas of 2013 Rudy gifted it to me. It was such a lovely surprise. He had saved it for last so I thought I had no more gifts to open until he surprised with me a huge box. This is such a classic bag in my opinion. I got so much good use out of it and till this day I always go back to it when I find myself wanting something simple and black. I also really enjoy all of the gold hardware detailing. The second bag was another one that was gifted to me from Rudy this time for my birthday in 2014. I had been wanting a small crossbody bag that I could wear, and I specifically wanted one to use during our trips to Disneyland. I had my eye on the Marc by Marc Jacobs small Classic Q Percy crossbody bag so it was pretty simple when Rudy was purchasing my gift. I love the size of this bag because it's small but I am able to fit in essentials. I was able to get so much use of this bag during all of our trips to Disneyland and it's still a bag I find myself using from time to time. The next bag in my collection is the Kate Spade large crossbody bag and I'm not sure what the name or style of this one. This was also a gift from Rudy for my birthday in 2015. I have to admit I've been a very lucky girl to get such amazing gifts for my birthday from such an amazing man. I remember falling in love with this bag the first time I saw it and wanted to immediately take it home with me. At the time, this was my fancier bag in my collection. The size was absolutely perfect and I like that it has a long strap that I can use crossbody or I can hold it by its handles. The only con I have about this bag is that it doesn't hold its shape very well. When I'm not using it I usually fill it up with some stuff so that it doesn't lose its structure. In April of 2016, I purchased a Kate Spade small crossbody bag. Again, I'm not sure what the name or style of this bag is, I purchased it from the Nordstrom Rack. I was obsessed with Kate Spade which you will see and wanted to add a smaller bag into my collection. This was another bag that I picked up just in time for one of my Disney trips to replace my Marc Jacobs one. I love how simple this bag is. It's the perfect "little black bag" and it's surprisingly spacious inside. I still switch off with this bag when I need a small bag that I know will go with any outfit I wear. The material of this bag feels very nice and it holds its shape extremely well. Plus cleaning it is a breeze. I've used it so much that even the logo is slightly rubbing off. Alright, this next one is probably one of my all-time favorite bags and one that I always get questions and compliments on! One afternoon in May 2016, Rudy and I visited the Livermore outlets where they had a Kate Spade store. During our visit, I spotted the most amazing bag ever, the Kate Spade Felix Newbury Lane Flamingo small satchel! Clearly, I wasn't in need of a new purse since I just purchased one a month before but I was so lucky to have found this bag since it was on sale for 80% off. Such a steal! It was an offer I couldn't turn down Rudy even said so himself. So I treated myself to this beauty. I love this bag so much especially because of the shape of it. It's also the perfect Spring and Summer handbag. Twenty-sixteen was definitely the year of handbag purchases because later in October I treated myself to the Harvey's Marilyn Satchel Disney/Queen of Hearts bag. This is my only Disney bag which kind of surprises me knowing how much I love Disney. Till this day I find this bag to be so stunning. This bag is so unique with the card pattern throughout the bag, oh and the pop of red contrasting against the white. Love! Inside the bag, it's very spacious which is always a plus. However, one downside which really isn't even a downside, to be honest, is how dark the inside of the bag is. The lined fabric on the inside is dark which makes it a challenge to find whatever I'm looking for inside. Since December 2016 I had been wanting to add a blush handbag into my collection. It took me forever to finally find a blush colored purse that I actually liked. Some were too much on the coral side while others were too washed out. In March 2017, I stumbled across this Ted Baker Chania leather crossbody bag in baby pink and immediately fell in love. I appreciate that it's a very simple yet sophisticated plus I was drawn to its rose gold chain strap. (I just came to realized I have a thing for simple handbags.) This bag is so light-weight which is always a plus. I hate when a purse itself is heavy and it has plenty of room inside for all of my essentials. This is another bag that I get so much use out of specifically in the Spring and Summertime. For the longest time, two years-ish, I had this bag on my wishlist. I knew it would have been unlikely for me to own it because of how expensive it was until Rudy surprised me with it a few months ago. In June, I finally owned the perfect blush handbag, the Mansur Gavriel Patent Mini Bucket Bag in blush. I remember when these bucket bags started blowing up all over social media. It was a hot item for tons of bloggers and I wanted in! I love this patent version because cleaning it is so easy. Also, don't let the mini fool you because it's the perfect size purse for day to day wear. I absolutely love it and it's currently by far my favorite designer bag that I own. It is definitely one of those bags that you love so much you get scared to wear it too much just so you won't ruin it haha. Finally, the last bag in my collection is the Mansur Gavriel Patent Mini Mini Bucket Bag in rosa. This was recently added to my collection in August, Rudy purchased it for me as an early wedding anniversary gift during the Mansur Gavriel sample sale. There really isn't much to say about this bag since I've already mentioned how much I love my mini bucket bag, this is a size down. Don't let the name mini mini deceive you because it's a great sized bag even for everyday wear. I was using it every day since I received it up until recently (which you can see in a lot of my recent posts) and I managed to carry a handful of items inside. I never once said I wished this bag was bigger. I also really love how neutral the color is. Online it is described as a light pink shade, however, I think it's more of a light washed peachy color which I am all for! Thank you so much for staying with me until the end. I'm hoping to begin sharing some more collection posts. I'm thinking a festive one with the Holidays being around the corner. How does an ornament collection sound? I hope you enjoyed my designer bag collection. Until next time! So many pretty bags! I love the Ted Baker crossbody! Omg girl SAME! Purses are my favorite accessory. If I could I would probably have gotten a few different colors of the Marc Jacobs bags. They're so nice and such amazing quality. I find that they wear so nicely. Thank you so much for stopping by Allie! I have to agree with the Harvey purse, I always feel like I'm falling down a rabbit hole when I'm looking for something inside the purse. Hehe! I love your collection, I've definitely gone a more simple route when it comes to my purses, and I have to thank Mansur Gavriel for that. Thank you! Yeah the Harveys bag is such a lovely piece but man I always need to use my phone flashlight to look for things inside, and if my phone is already inside the bag then oh man I'm lost. I love MG purses!